"Exploring Contact: Regionalism and the 'Outsider' Standpoint in Mary Noailles Murfree's Appalachia" (Legacy 2001) by noted scholar of regionalism Marjorie Pryse is available online (.pdf file). Anna Leach's "Literary Workers of the South" (Munsey's, 1895) includes a picture and brief description (below). Study questions for "Dancin' Party at Harrison's Cove" from the University of North Carolina. 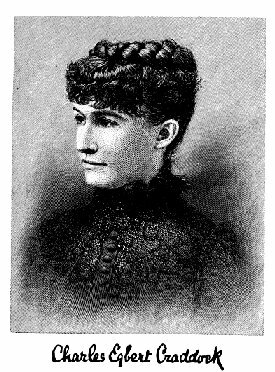 Miss Seawell might have written her stories from anywhere, but that is not true of the greatest woman writer in the South, Miss Mary Murfree, who is best known as Charles Egbert Craddock. Her work was published by a well known Boston editor for several years before he discovered that she was not a man. Her handwriting is very heavy and black, and it was Mr. Thomas Bailey Aldrich's joke to say, "I wonder if Craddock has taken in his winter supply of ink, and can let me have a serial." One day a card came to Mr. Aldrich bearing the well known name in the well known writing, and the editor rushed out to greet his old contributor, expecting to see a sturdy Tennessee mountaineer. When a slight, delicate little woman arose to answer his greeting, it is said that Mr. Aldrich put his hands before his face, and simply spun around without a word, absolutely bewildered by astonishment. Murfreesboro, Tennessee, was named after Miss Murfree's great grandfather, Major Hardy Murfree. The old homestead of the family is described in "Where the Battle Was Fought." It is her delineations of mountain character, and her descriptions of mountain scenery, that have placed her work in the place it holds. Her style is bold, full of humor, and yet as delicate as a bit of lace. To Mary Wilkins' gift of giving exact pictures of homely life, Miss Murfree unites great power of plot and a keen wit. The little old woman who sits on the edge of a chair in one of her novels, has added stores to America's proverbs. "There ain't nothin' so becomin' to a fool as a shet mouth," has taken its place with its older kindred.